Ég er pólitískt viðrini… Svo segir stjórnmálaáttaviti Moggans. Það er ekkert nýtt við Nýtt Afl. Finally got around to watching Clockwork Orange tonight, have owned it on DVD for a while. Fantastic movie. You can easily see why it’s considered a classic. I agree with the comment I saw on the web that it hasn’t aged much, only minor details would be different in a similar movie today. A good day. I had my nephew, his wife and 8 month old daughter for lunch, fed them rabbit. Was very nice. Then United beat Spurs to extend their Premiership lead. All in all a very nice weekend. whoohoo. My decision to go downtown when the Arse were 2-0 up and cruising after a crap first half paid off. Djorkaeff scored before I had stood up (see the .is blog entries below) and then Bolton pulled off the equaliser. Marvellous. Now to beat Tottenham tomorrow. Jahér. Bolton skorar, 30 sek. eftir að ég ýtti á postandpublish í fyrri færslu. Ég fer samt í bæinn. 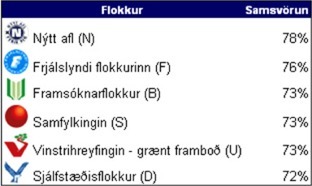 Skrapp í Kringluna í morgun, ekkert gaman að sjá eða fá þar. Arsenal er 2-0 yfir og öruggir um sigur, þó hálf vörnin sé farin meidd útaf. Þannig að ég ætla bara að taka smá heilsubótarrölt niður í bæ, og sleppa restinni af leiknum. *sob* bloody Iker Casillas. What a match. Real are 1-0 up. It’s not looking great. First day back after a five day weekend. *phew* Lots to do. It’s good just to sit back, do nothing and let the football on telly roll, without being stressed over the result. There’ll be enough stress for the match tomorrow. Been tidying up a bit. Found out I hadn’t put all my ties up on the tie hangers in the clothes cupboard, there’d always been a few floating around. Anyway, the result was that I was five spaces short. So I had to relegate five old ties from those hangers and fold them up and put them aside. Not that I’ve used them in a long time. Also realised that a tie i bought last year and thought I’d lost was hanging there all the time, it just looked a bit like a very old tie that I used to have so when I was looking for it I overlooked it. For the curious there are four tie hangers in my cupboard, each hangs 20. You do the math *grin*. yay! Waking up at 3am and not falling asleep again is so fun! Insomnia rocks! The only thing to do about it is to put on some good music atm it’s “Kim i circus”, Kim Larsen live in the Circus in Copenhagen. What do you mean you don’t know who he is? Awww…. Pity. Mind you part of his greatness is understanding (more or less) his lyrics. Oprah is on telly, just about to start, and it looks like the show is about ‘What to do with my life’ and the magic words are ‘Follow your heart’. No doubt there’ll be heart warming stories of people switching careers and doing what they want to do and being very successful. This has of course set me thinking. How many people actually have such a calling? Take me (I would do that wouldn’t I?). Five years ago I wouldn’t have dreamt I would be doing what I’m doing, but here I am, and liking it pretty much. I think I’m pretty good at what I do, and all in all it’s not bad. But in no way am I doing it because I followed my heart blindly. I went to uni, studied stuff, was good at some stuff, less good at other stuff and great at some stuff (last part being the smallest). And then I got a job more or less at random. etc. So, to me it’s more a case of ‘Find something you’re good at and that you don’t hate doing. And do it as well as you can’. For those people with dream jobs, great, but don’t come yapping to me about how I should dream and and follow my dreams. Being content with your life is underrated. Onthe other hand, it’s Saturday, it’s time to buy some audio hardware and wires for the ‘puter, lots of football on the telly and enough books to last the day. And the some. And if that’s not enough, I’m only seven eps into watching Babylon 5. Damn, this is nice. Saw Buffy 7.18 this morning. Good one, and shaping up to be a terrific end to the series. I don’t have a favourite ‘celebrity’. I have favourite writers, musicians, footballers etc. Heck no. I want my life for myself. Six AM and All Is Well. Five days of lazing around, reading, watching B5 and recharging batteries. What a match. and a draw. Their 2nd was offside, but we scored our while they were celebrating. So maybe it evens out.